Page 2: 1980 - date. 1980-82 The Best Range Yet. The 1981 catalogue showed a vibrant range, re-boxed once again and complete with new accessories and new games. 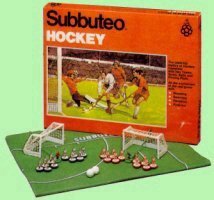 The rugby and cricket games were still fully supported, and although Subbuteo had finally decided to drop some of the out of date teams from the football range, there were still over 300 teams available. The most important new arrival was a player to replace the zombie, a figure known as a lightweight. This figure combined and improved on the traits of both the heavyweight and the zombie. The new piece had the peg and base of the zombie, as well as that figure's ability to be machine painted with small, thin details. But it also had some of the action pose, and detail of the heavyweight. The figure was test marketed in 1980, and introduced with a fanfare in the 1981 catalogue. Quite rightly too, as this was the figure that Subbuteo continued to use until very recently. Although the machine painting did sometimes leave white patches under the arms, it allowed badges, pin stripes, shirt advertising, and all manner of strange kits to be reproduced in miniature. Starting with the range of 1982 World Cup teams, Subbuteo team boxes were designed to show the whole team for the first time, such was their confidence in this new product. The catalogue also introduced two new games, Subbuteo Hockey, and Sport Billy, a Subbuteo for youngsters. I think Sport Billy was the first sign of modern day marketing and brand names to appear in Subbuteo. Basically, Billy was a European cartoon character who represented "fair play" in sport, and was mascot at one World Cup. The Subbuteo set was five-a-side, and the players were oversized with big heads. Not sure how well these would have actually played. The hockey game played rather like Subbuteo football, and was the first Subbuteo game aimed at girls. It featured rather nice players with very fragile sticks. The new accessories of 1980-82 reflected real football at the time. There was a high cage-like crowd barrier, mounted police, crash barriers, and an astropitch, a wonderful (when it stayed flat) rubber backed playing surface (with a nod to Queens Park Rangers). The introduction of the Astropitch also heralded the end of baize pitches in the box sets. These were replaced by thin nylon pitches with visible threads, which were always in need of ironing, didn't stay flat on the carpet, and tended to unravel at the edges. I assume this was a cost cutting exercise, and if you wanted to play seriously in this period, a smooth Astropitch was the way to go. The 1981 catalogue is normally held up as the best catalogue produced, showing the biggest range. In fact, the 1982 range was probably better, but there was not a catalogue produced that year for customers, just a large poster. So the 1981 catalogue is the one to have... Additions to the 1982 range were mainly due to an attempt to break into the American market. This saw the arrival of 17 North American Soccer League (NASL) kits, and the five-a-side Indoor Edition. After Football Express had ceased around 1977, the five-a-side spot in the range had been taken by Top Scorer, which wasn't much more than a normal Subbuteo game on a half-sized pitch. The Indoor Edition was based on the NASL indoor seasons, and featured the delight of rebound walls and a blue, Astropitch quality surface. It didn't quite have the class of Football Express with its lock-in goals, but it was a welcome addition. Another nice set was C189 The Skills Trainer. This had a half pitch marked with exercises to improve your play, plus cones to dribble around and the return of the 1970s target board. The strangest set released was probably the high bounce balls. These were made of sponge, and were like the life size indoor footballs of the time. To top everything in the 1981-82 range, there was the glorious World of Sport Compendium containing the full football Stadium Edition, plus the Rugby International and Test Match Cricket editions, all wrapped in a huge carrying case. This cost around £75. and only about a thousand were ever made. Sadly, Britain was in one of its periodic recessions at the start of the 1980s, and the warning signs were there for the Subbuteo range. The 1982 price list divided the teams and accessories into those available at all stockists (top 100 teams only) and those "available on request". All the rugby and cricket accessories were "on request". It was an important difference, because most of the items on the second list disappeared completely within a couple of years. Another important event was Subbuteo's departure from Kent. With the arrival of machine-painted teams, I guess the expensive southern workforce was no longer required. So Subbuteo spent 1982 on an industrial estate in Tyne and Wear, before settling in its new home of Castle Gate, Outen, Leeds. At the same time, the company name on the boxes changed from Subbuteo Sports Games Ltd, to "Subbuteo Sports Games, A Waddington Games Ltd company". This was the final high point of Subbuteo production, and it was never the same again. It lost that personal touch which in the 1970's, for instance, allowed you to order throw-in figures in ten different strips. The hard commercial world had finally caught up with Subbuteo. The team range survived a bit longer, but between the 1986 and 1987 catalogues the number of teams was cut drastically from 298 to 169. Even the football box sets didn't escape. By 1987 there were only two left, the Club Edition and the World Cup 1986 Edition. Part 2: 1987-95 A steady ship. After the purges of the mid 1980s, Waddingtons were obviously keen to revitalize their new compact range, and bring it to a new audience. To this end, they created a major new look in 1988, with the production of a new grandstand. The seating pieces of the new stand are the same as before, but they were now coloured red and blue. The top tier was set back, with executive boxes, and transparent side panes. The whole thing fitted together much better than the old stand, and it was also more stable. The terrace and corner piece were switched to a light grey colour, and this changed the whole look of the stadium. This new look is completed in 1991 with the arrival of the sleek "Greek pillar" floodlights (61222). Apart from that, the accessory range remained pretty much the same throughout the whole period. There were a few ball and goal changes, but there were always five ball sets and four goal sets available. Some of the ball and goal changes were down to the 1990s strategy of acquiring licenses to produce accessories branded to real life football events. So there were goals, balls, and a pitch for Italia 90, and a box set, plus goals and balls for USA 94. In 1995 Waddingtons add two more licenses. Firstly there was Euro 96, and a chance to catch the excitement of the most important football event in England since 1966. Secondly, they started producing items branded with the Premiership logo. The range consisted of a boxed edition, an accessory set (sadly overpriced), and the full quota of Premiership teams in special boxes. This series had home kits for all 20 Premiership sides, plus six away kits, and a Man Utd 3rd kit. Around the same time, Subbuteo hit the headlines by adding three black players as standard to each English side to reflect the number of coloured players in this country. All very sensible, although it was pointed out that there were no blond subbuteo players either (well, except for Roy Race). Actually, these weren't the first mixed race teams, as the France side of the mid 1970s (No.164) was often painted with two black players, and I think certain other French league teams had a couple of dark skinned players as well. Away from the Premiership, the team range hovered at around 150 different kits for the whole period. About 50 or 60 of these were standard sides that simply stayed in the range for year after year. A vast majority of the others represented the constant changes of kit by English league teams, who had got into the habit of slightly altering their trim every couple of years. Waddingtons, to their credit, heroically kept up and this I imagine provided a good income stream. Certainly I bought Liverpool's away kit 4 or 5 times.... By the late 1990s Waddingtons had given up trying to give each new variation a different number in the range, so in an extreme case, you had four completely different Arsenal away kits on number 743. American giants Hasbro acquired Waddingtons in the mid 1990s, and presided over another decimation of the range. Whether this was already planned by Waddingtons I don't know. What is certainly true is that Subbuteo was not selling well, and old unsold teams were a familiar sight in toy shops. The accessory range was the first thing to go. Between the 1995 and 1996 posters, we lose the terrace and corner piece, the floodlights, the astropitch (which really annoyed a lot of players), plus all the spare goalkeepers, goals and all the ball sets - although the later were replaced by a bubble pack containing five assorted balls from the range. The 1996 poster turned out to be the last one produced. The team range was renumbered after this, and the number of teams dropped dramatically, first to 46, and then to just the Premiership sides plus England and Scotland (however, a range of six French sides was produced to cash in on World Cup fever over there). This big decline in output was especially sad, because the teams that Hasbro released were really good, and their box sets were some of the most interesting for years. The most important change that Hasbro made was to the teams. The Hasbro teams were produced in a new box, with two un-based players shown in windows. On opening the box, you found that the players arrived unattached to their bases - just like in the 1950s. Hasbro also kindly supplied eleven outfield players, so you were covered for breakages. However, the key change was the bases, and whether this was a good thing or not seemed to divide players depending on their style of play. The bases were a one piece/one colour design, seemingly solid and without a metal weight. They were lower than the old lightweight base with a much larger flat bottom and a thinner curved edge. This made the figure stable, and long straight flicks much easier. The low height also made the chip shot achievable. The downside was that the small curve made it almost impossible to swerve the players. I've heard serious players who use the "polished bases" style of play, describe these bases as the best official ones ever produced. Then again, players who play for fun, and enjoy the swerve and spin of the older teams have described a Hasbro figure game as like Shove ha'penny. Take your pick! The Hasbro box sets all had something different to offer. They started by taking over the Euro 96 set and adding Hasbro based teams and the flags. They also re-boxed the Premiership set a couple of times, and it gained a scoreboard. But the real interest comes in the later sets, after they had re-boxed them down to a more convenient size. The World Cup 98 set was hardly seen in the UK, and many seem to have remained unsold. But it featured a lovely French side, plus brand new corner kicker and throw-in figures. Using a standard player and goalkeeper and simple bases, they actually deliver good results. Then there was the Man Utd. Edition. This had the usual accessories with a Man Utd. twist - the fence is red, not green, the centre circle and balls feature the club badge, and you get Man Utd. home and away kits as well as a standard blue team for them to beat. Even the repackaged "Club" edition of 1997 had a surprise. The pitch is made from a new style cloth - not as good as the 1970s baize, but certainly better than the nylon. Shame it only appeared in this set. Hasbro also produced a lovely special boxed England kit, and they let Boots (the Chemist) issue some fun Chocolate editions each Christmas, which I hoped would bring new players to the game. I guess these also helped Hasbro get rid of any players they had in old kits! Hasbro also used the brand name to produce a collectable card game called Squads, but this had nothing to do with the real Subbuteo, and seemed to sink without trace. The Premiership teams continued into 1998, and more were released for that year. Some of these final teams were really fantastic, and yet I hardly saw any of them in the shops. In fact, I only became aware of them when I started this site, and the details were kindly sent to me. For instance, as a Liverpool away kit collector I was surprised to find a final yellow Liverpool away kit was produced. But when I think back, I can recall how many unsold copies of the previous year's cream and black I saw as I traveled Sussex and Kent with my job in 1998-99. I also noticed that the local toy chain, Gamleys, were selling off their remaining Subbuteo stock in all their branches at this time (Notts Forest, Wimbledon, and Middlesboro seemed to be the unloved teams down south). So Subbuteo's fifty years came and went without any great fanfare, and its chances in the next fifty years do not look so rosy. When I wrote the line above about Subbuteo's fifty years in March 1999, I didn't have any idea how close Subbuteo really was to dying. There were rumours on the Subbuteo discussion page in December 1999 that Hasbro would wield the axe after Christmas, but as they had just issued a rather stunning Manchester United edition I still had some hope. This was soon dashed by Hasbro's announcement of a ceasing of production in January 2000. Perhaps surprisingly, Subbuteo's sad demise made it big in the news, being featured on all major TV channels in Britain. I particularly enjoyed the report on Channel 4 News. Whether this was intended by Hasbro, I wouldn't know, but it did create a large backlash, and Hasbro were so overwhelmed by the response that they reversed their decision and granted Subbuteo a stay of execution. New sets were announced in an exclusive deal with Toys-R-Us but it was a long wait for them to arrive. The Subbuteo community was expecting them in Sept/Oct 2000, to catch the Christmas sales but in fact, they missed that Christmas all together, actually limping into some Toys-r-us stores on Christmas Eve. Very frustrating. The new sets were a re-released Premiership set, an updated version of the Man Utd Edition, and a deluxe set with the return of the grandstand (this time in red and white) and three teams. This was a lovely set, but for those worried that Hasbro didn't understand the product, the fact that the third team was in yellow shirts and white shorts was a bad sign (because who plays in those colours??). The new range also included ten teams in attractive redesigned boxes, a spare set of goals and a spare set of balls. The teams were top Premiership sides (or at least those with big fan bases) Arsenal, Aston Villa, Chelsea, Everton, Leeds, Liverpool, Man City, Man Utd, Newcastle and Spurs. The kits weren't all 100% accurate, but there were some really nice ones among them. In fact, only Everton and Arsenal really disappointed in their design. While the players were good, the bases were a disaster. They were still one piece, but were back to the old shape, which wasn't the problem. The trouble was that the bases had a terrible finish, and the bottoms were often not flat. Wonky players do not make for a good game. This wasn't the range I was hoping for (I really wanted a Premiership Bradford City!) but it was a start, and I was really hoping it would sell well, and thus encourage Hasbro to increase the range. However, the exclusive deal with Toys-R-Us didn't help to push the game, and even in their stores the range was usually hidden away and only partially supported. In my local store, there were at least three teams I never saw for sale, nor did I see the balls pack. You couldn't order teams from a store, so the only way to get them was via Hasbro's UK website. The marketing was been pretty non-existent too. In 2002 Subbuteo hit the headlines again when a story about Tom Taylor's unofficial Subbuteo streakers blew up into one of those humourous stories radio stations enjoy. A report on the BBC website stated that "Marketing experts dismissed the move as a publicity stunt, an accusation denied by Hasbro" which seems pretty ironic. Perhaps I'm being unfair. Maybe the sad fact is that the detail and atmosphere of multi-player football games on computers and consoles have finished off Subbuteo as a viable product. However, Super Striker, a 1970's football game, has recently been reintroduced, and as football is such a huge global phenomenon, there does seem room, at the very least, for a basic Subbuteo set selling to the board game market. While Hasbro seemed uninterested in the product itself, the uproar over the 1999 cancellation proved to them that they had a winning brand - and one much loved by the high earning thirty-something age bracket too. In these days of marketing and hype, that seemed the most important thing. A report in the Revolution on-line magazine stated that Hasbro wanted to make Subbuteo "the football lifestyle brand of 2002". To this end, Subbuteo clothing arrived at Next, and other stores. Branded pub quiz, and mobile phone games were planned, and a new football game was launched carrying the Subbuteo logo, where you dressed your fingers up in a little football kit for a dumbed down, after-the-pub style game that cheapens the name. When I hoped Subbuteo would get some new products for World Cup year, this wasn't what I'd envisaged. So here is my personal vision. I'm no expert on these things, but I'd look to the success of Corinthian figures for inspiration for a future Subbuteo - after all you can't really do anything with those big headed things. I'd have a basic box set, and then sell sealed packs of players in random kit. You'd have to collect and swap these to build up teams, first to play five-a-side, and then full eleven-a-side matches. The Hasbro bases are ideal for all-star teams in different kits on the same colour bases, so you wouldn't need to collect a full team to play. You could have all the usual collectors stuff - limited edition kits (e.g. South American sides, historic sides), limited edition colour bases, even limited edition players maybe. I'd be giving the things away in cereal packets, and selling them cheaply in newsagents. It would be like footie stickers, but with gameplay! Hasbro Part 3 - 2003 onwards. Photo-real vs Table Soccer. My flight of fancy above was written in 2003. At that time, the game's "last hope" was Edilio Parodi, the family company that took Subbuteo to the Italians in the 1970s, and who had been producing a clone of 1970s Subbuteo called Zëugo since the late 1990s. 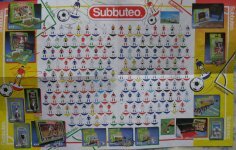 Parodi gained the rights from Hasbro to sell new Subbuteo items for the Italian market, and after selling off Hasbro's old warehouse stock, they produced their own range. As well as a new box set and a welcome return for the Astropitch, this Parodi range featured a new playing figure, a redesigned base better suited to the modern game, new goals, and even a new fence. The teams were hand-painted in China, and the initial range was an impressive 115 sides. However, Hasbro also had plans for a relaunch, and it was announced in December 2003 that Parodi's licence would not be renewed for 2004. This decision was reversed, and then further delayed.... to the point where the teams were still being sold as at November 2005, and new clubs continued to be added to the range. There are plans to relaunch under a new name at some point (by main wholesaler Astrobase, whose owner Enrico Tecchiati designed the Parodi products). Parodi do seem to have switched production back to their Zeugo range. It should be noted that these are not huge toy companies, and this production has always been small scale. In England, collector site Subbuteoworld eventually gained a monopoly on this range, and has been producing "exclusive" sides for his customers. Even the box set was not easy to find in Italian shops. So for a mass-market set to bring new blood into the game, we have to return to Hasbro's plans. Their new Subbuteo game was released early in 2005, initially exclusively to Toys-R-Us, but available elsewhere after July 2005. It features in a number of Christmas catalogues. The new version is called "photo-real" Subbuteo and features flat plastic players with the faces of real footballers. The players are from eight top European sides, and feature in their club kits. You don't buy full teams, but instead receive a random assortment of players. The colour of the base differentiates the two teams (red or blue). It is a radical redesign, but some of this sadly is down to cost. Hasbro obviously relied on their own designers for this overhaul, rather than talk to current players or collectors. The result is that neither of these groups is happy with the new set. Of course the main market for this set is not these groups, and if Hasbro sell shed loads of sets to youngsters, they won't care a fig. We'll have to wait and see. The better news for older fans is elsewhere. The internet has really produced a boom time for Subbuteo and also for table soccer, which is essentially Subbuteo without the official branding. Table soccer is used to independence having initially split with Subbuteo in the 1970s when the skilful flat players were no longer allowed at official Subbuteo tournaments. With a surge in table soccer interest, but little official Subbuteo output, a number of small, innovative companies have filled the gap. These people are part of the community, and names such as Stefan Corda, Santiago, or Flickmaster will bring a smile to the face of many. It's an interesting time for flicking. That concludes my Subbuteo history. Time to pick another page.